Thirty-six years later, “George” gets a banner across his chest. This, however, was far from my limited experience of “George.” Nevertheless, an unforgettable impression was made. Once those bells start ringing in your head, something must be done. Cut to the chase, after it was officially over, (though some would say it was only ever over in my head, or put another way, I was in over my head) I decided to paint the portrait he never got around to sitting for. I painted it from memory. From my imagination. From the intuitive feeling I had when I thought of him. This is actually a rather long story, dealing with one’s muse, the anima and animus, the inner male, the wounded soul, and recognizing a wound in the “other” before being able to deal with it in oneself. I will get to that as it fascinates me like crazy. 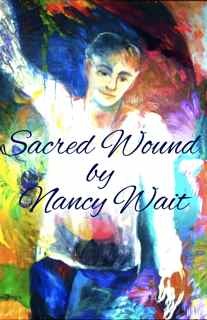 Meanwhile, tune in next week on March 19th to Blog Talk Radio where I will be reading from my mini-ebook Sacred Wound (“George” isn’t mentioned; it’s enough he’s on the cover), and giving the book away free. I will also be performing a radio play I wrote called “Mr. Woundid and Ms. Heeler at the Starbucks Cafe,” which tries to be funny! Hope you will join me. 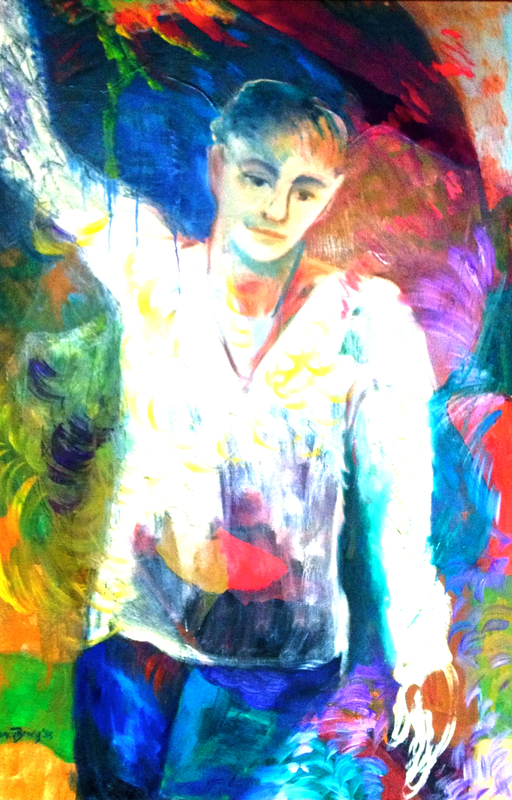 This entry was posted in ART, Blog Talk Radio, Wounded Healer and tagged Art, art and healing, autobiography, blog talk radio, expression, Nancy Wait, painting, sacred wound, the nancy who drew, writing. Bookmark the permalink. You’ve piqued my interest about him ;). Lovely book cover. Thanks so much! I’m writing in detail about the episode in my forthcoming sequel to my memoir – hope to bring it out this summer – and displaying this painting like I am now – really makes me want to get on with it!